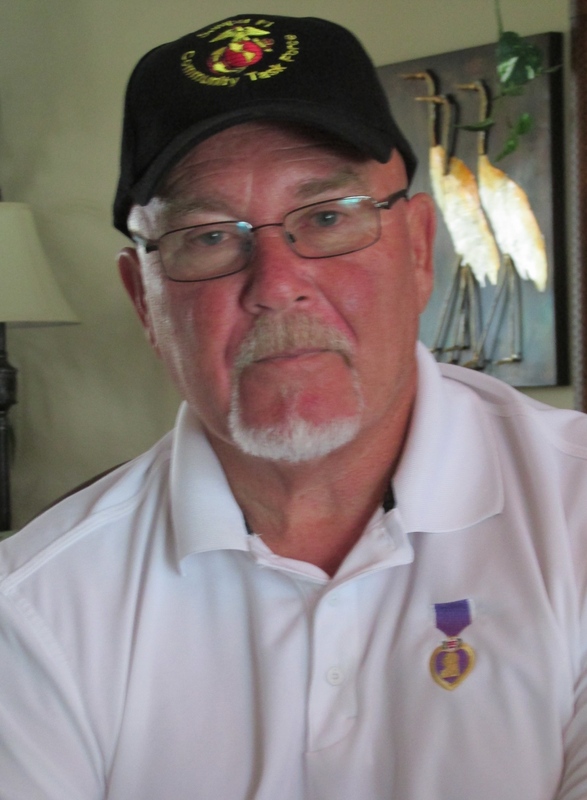 Randy McConnell of Nokomis, Fla. received seven Purple Hearts, more than any other living American soldier, for six months of intensive fighting with the 101st Airborne Division in Vietnam during the “Tet Offensive” in 1968. He was also awarded two Silver Stars and a Bronze Star for valor together with an Army Commendation Medal with a V-device for valor. His world came crashing down in his freshman year at the University of Michigan when injuries sidelined him from the football team. He lost his college scholarship and ended up joining the Army in 1967. 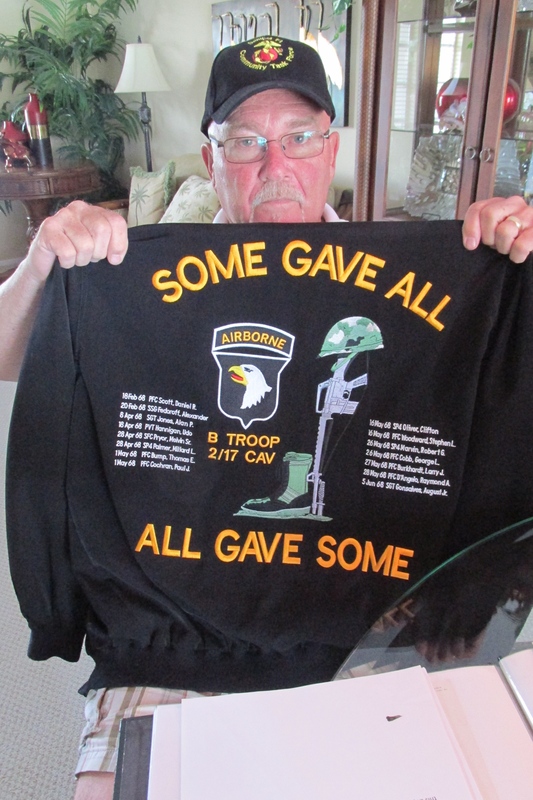 His uncle served in the 101st Airborne Division and convinced him to go airborne and become a “Screaming Eagle,” too. After jump school he also became a “Pathfinder.” These soldiers established landing zones on battlefields and lead troops into war zones. In December 1967 McConnell went to Vietnam attached to B-Troop, 2nd Squadron, 17th Cavalry, 101st Airborne Division. He arrived in country a month before North Vietnam launched the “Tet Offensive.” This was the largest series of battles during the Vietnam War involving upwards of 80,000 North Vietnam Army and Vietcong guerillas and the fighting lasted through May. It was a military disaster for the North, but at the same time “Tet” caused many Americans to side with the Vietnam Protesters in this country against the war. It was the beginning of the end of U.S involvement in Vietnam. “I was 21 on Jan 30, 1968, the day before ‘Tet’ started. We were at a rubber plantation near Bien Hoa where we set up a defensive perimeter. We were there about a month,” the 68-year-old local resident recalled. “That’s where I got my first Purple Heart on Jan. 31, 1968. We had been probed at night by the Vietcong (VC) and the North Vietnam Army (NVA). They attacked that night and we killed maybe a dozen of the enemy. I was one of the people sent out to retrieve some of the enemy bodies. “I found a body, rolled it over and started dragging it back to our lines. The enemy had already booby trapped it with a white phosphorous grenade. As I began dragging the body the grenade went off. I got burned on my chest in the blast. “I received my first Silver Star a short time later when we were moving up Highway 1 with armored personnel carriers. I had a gun Jeep with an M-60 machine-gun mounted on it. “Along the way we dismounted and went out on a search and destroy mission. We were searching rice paddies for enemy when we came up on a tree line and ran into two enemy machine-gun bunkers,” McConnell said. “Before my platoon could flank the machine-guns and knock ’em out, they wounded or killed 47 of our men. Seven of our men were evacuated and one was killed. “We had to maneuver closer in under enemy fire to take the bunkers out. I had an M-16 rifle and my Grenadier had an M-79 grenade launcher. When we got close enough to do the job, I laid down supporting fire so he could lob a grenade into the enemy bunker. “Just before we were able to knock out the second bunker I got shot in the chin and chest. It was kinda of a bad day for me,” he recalled more than four decades later. Eventually we knocked out both bunkers and took some NVA prisoners. It was the battle in which he received his second Silver Star McConnell recalls best during the six months and three days he served in Vietnam. “We were in LaChu when our squadron commander Lt. Col. Julius Becton, who later became a lieutenant general before he retired, decided we were going to attack the enemy at night in formation. He had no idea what we were getting into. “At 2 a.m 100 of us initiated our night attack against, what we learned later, was the D-212 NVA Battalion intrenched and waiting for us. It was by far the worst battle I was involved in,” he said with a grimace. 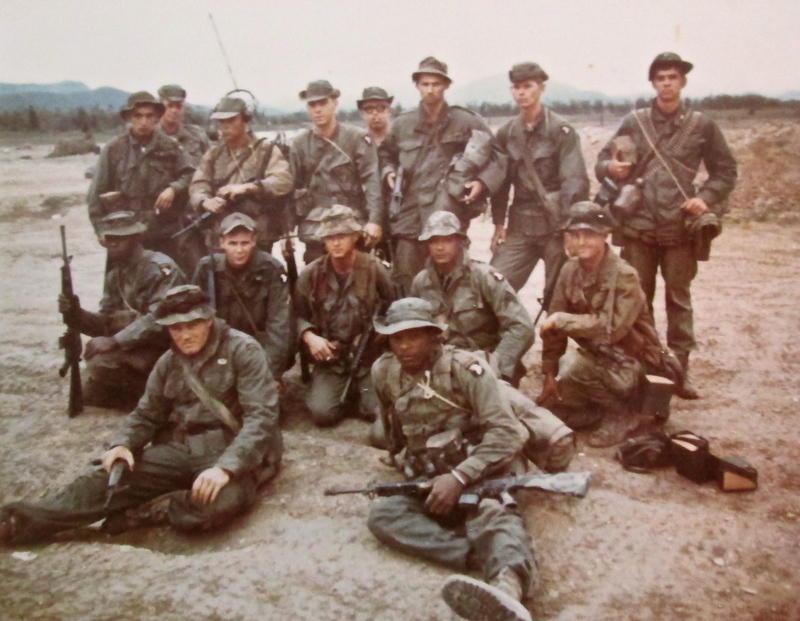 “We were drastically out numbered by a seasoned NVA battalion who knew the territory. “It was pitch black night when the enemy opened fire on us. Immediately I ran into an enemy machine-gun bunker. I returned fire and right away two more NVA soldiers popped out of spider holes on ether side of the machine-gun. I shot and killed one of the soldiers holding an RPG (Rocket Propelled Grenade),” McConnell said. “I got the second soldier in the other spider hole just as he fired his RPG at me. It hit the side of an armored personnel carrier beside me, then hit the ground in front of me and spun like a top. I knew it had a time fuse that would go off any second. “When it exploded it threw me into a nearby tree. I was hanging upside down from a branch with a piece of shrapnel in my neck. I thought I was a goner. “That’s exactly what I did. For helping knock out two NVA bunkers I received the Army Commendation Medal. “My squad’s machine-gunner, Robert Patterson, wanted to continue the fight. I told him, since we had penetrated the enemy’s perimeter defenses we need to go find their command post. “I sent Patterson and two others in our fire team one way and I took the rest of our squad and went the other way. By somewhere around 2 p.m. the shooting was over. Patterson and his group had knocked out seven enemy machine-gun bunkers and my group had taken down another seven. “We never found the enemy command post. “It was only by the grace of God we survived all that happened that morning. It was a matter of laying down screening fire and getting close enough to take out the enemy bunkers with grenades. We took one after another after another bunker. “For his efforts Robert Patterson received the Medal of Honor and I was awarded my second Silver Star,” McConnell said. “By this time our unit had quite a reputation for killing the enemy. We would leave ‘Kill Cards’ on dead enemy soldiers to let the NVA and VC know who killed their men,” McConnell said. The cards are the size of regular playing cards. 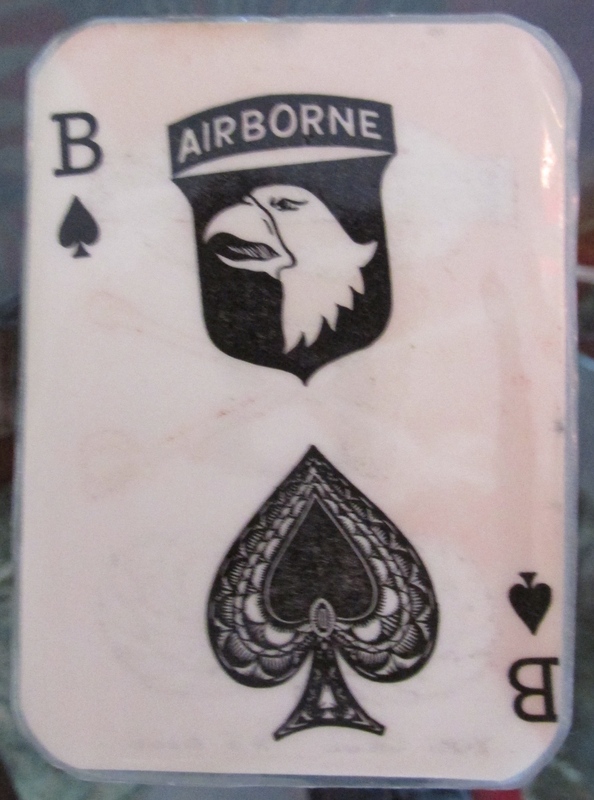 They have the Ace of Spades with a 101st Airborne patch and a “Screaming Eagle’ on them. “My seventh and last Purple Heart came when my Achilles tendon was hit by shrapnel from a mortar shell fired by the NVA or VC on May 20, 1968. When the enemy first attacked I had 22 magazines of M-16 (rifle) ammunition in my vest,” he recalled. He was evacuated to a hospital in Yokohama, Japan and later sent to Beaumont Army Hospital in El Paso, Texas to recover from his ankle wound. Weeks later, when McConnell could walk without the aid of crutches, he was allowed to return on leave to his Michigan home. “I flew into Detroit on a civilian aircraft on my way home. I was dressed in my khaki uniform, three rows deep in ribbons on my chest, my shoes were spit-shined and I had the Airborne glider patch on my hat. I thought I was probably going to be greeted as a war hero. “I had no idea about all the Vietnam War protests that had been going on back home. When I reached the airport in Detroit I was greeted at the gate by a group long-haired hippies who spit on me.” he said with emphasis after decades. “You have to keep in mind, I was coming right off the killing fields with no counseling. I was thrown into this situation without any preparation. I was in a bad mental state at the time having see so much battlefield action. I wasn’t concerned about what the hippies might do to me, but what I might do to them if they got close enough. After attending college and graduating as an engineer, McConnell spent the next 30 years of his life working as a water and sewer superintendent in three Michigan communities. He and his wife, Becky, retired to southwest Florida in 2003. The have three grown daughters: Kelly, Staci and Erin, nine grandchildren and six great-grandchildren. Commendations: Seven Purple Hearts, two Silver Stars, one Bronze Star with V-for Valor and an Army Commendation Medal with V-device for valor. This story was first published in the Charlotte Sun newspaper, Port Charlotte, Fla. on Monday, May 11, 2015 and is republished with permission. I appreciated the comment. I got it correced. This is Randy McConnell Don. I have a few corrections for you to make. The battle on May 6 1968 was in LaChu, the colonels name was Julius Becton. I was born in Cass City Michigan. My army commendation medal was issued with a “V” device for valor. Great job Don sorry it took so long to reply. Sincerely Randy McConnell. Glad you were satisfied with your story. I’ve made the requested corrections. Thanks a great story and the time you spent with me. Thanks Dan. I’m glad to be home and still vertical. While looking up information on my brothers unit in Vietnam I came across your story. In the story there is a picture posted of you holding a jacket with the names of members of your squad who were killed in action. I was amazed when I saw my brothers name on the jacket. As a retired infantry Marine I now know that my brother was being lead by a true warrior and couldn’t have had a better leader. I want to personally thank you for honoring my brother and those who made the ultimate sacrifice. It means very much to me and I hope we can correspond at some point in the future. Thank you sir. Trying to contact you re: LCHS 50 yr reunion 8/22/15 @ Gowanie Golf. Would love to hook up with you and Becky this winter. Ron and I live in Ft Myers. 239 2075535. Give me a ring. It was so great to read this article about you. I often talk to my friends to this day on how much I enjoyed you and denny up at my hunting camp years ago. I wish you best in retirement my friend and good fishing!!! Thanks Larry. We had some great times at your place. Would like to do it again before its too late. We are enjoying it in Florida and still have a home in Michigan. Hope all is well with you and the family. Great story about a true American Hero. Your still my personal hero Randy god bless. Thank you for all you and your family gave this country. I’ll bet if the paperwork wasn’t lost he would be wearing the CMH (congressional Medal of Honor)! The award is not called the Congressional Medal of Honor. Hi uncle Randy it’s Kai thank you so much for taking me out on your boat I had so much fun. I hope we can go out another day. Thank you so much. Thank you Donna. It’s an honor to have such great young family members. Hi. Randy. I am your neighbor in Venice. Your “story” ran in the Venice Herald Tribune on Friday May 26th. You are a true hero ! I wish I knew your address so that I could come by and give you a hug. Q. Are you a member of the American Legion in Venice ? Thanks Harry , 213 Chardin Drive. Thank you Caden, your reach out was very nice. I’m the retarded one Kai talks about. Read your accounts in Vietnam and had the honor and privilege of knowing you and Becky. You are and will always be a hero to me and many others. An example to all what a true hero is. It’s an honor to have had the opportunity to know you. Hope to see you both when I am in Florida.